Marvel Super Heroes #55, 1976. “Where Walk The Immortals” | Magazines and Monsters! Today’s cover is one that initially appeared back in 1968 (Tales to Astonish #101), but in this reprint, it was in the mid 70’s. Story by Stan Lee, and pencils by Marie Severin! The inks by Frank Giacoia, and letters by Artie Simek. 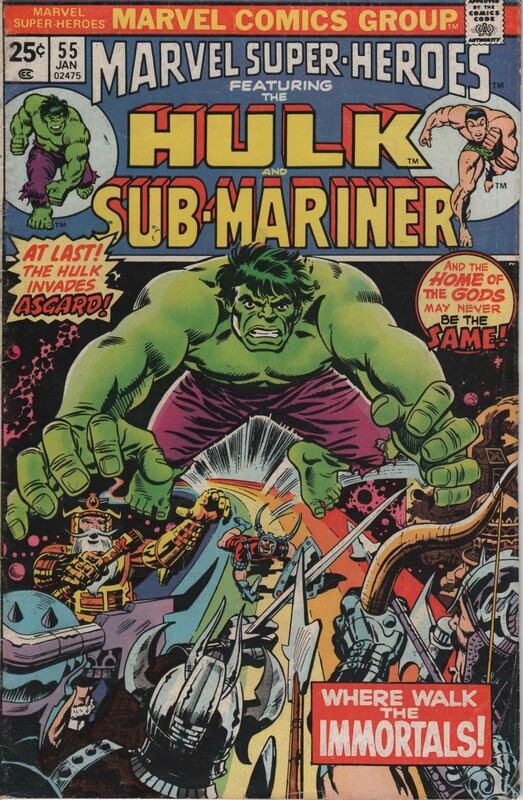 One story features the Hulk, as he travels across Bifrost (the rainbow bridge to Asgard), tossing Heimdall off in the process! The second tale about Prince Namor of Atlantis, was brought to us by Archie Goodwin, Gene Colan, and Dan Adkins! Imperious Rex! Cover by Jack ‘King’ Kirby! Enjoy!